Who are Envirodyne Group & what does the Company do? Envirodyne Group Pty Ltd (EDG) was established in 2000 to amalgamate air and water quality expertise in Consulting services, with the unique in-house developed technologies in Products and Systems aimed at addressing problems of automated online monitoring and process control for remote sites. This amalgamation also allowed EDG to augment its in-house expertise with proprietary systems from other firms, so that EDG can now offer clients a range of solutions from individual plant items to total turnkey projects. EDG Principals recognised that the issue of Risk Management was a major 'driver' for many firms confronting environmental compliance. Unless business management and stakeholders understand the ramifications for their organisations' breaching of regulatory set points for plant operations, then they increase their Risk of incurring substantial fines for environmental mishaps. Under these circumstances, they will also lose credibility in the eyes of the local community if they then try to portray themselves as good corporate citizens, as most communities know 'spin' when they see it. In these litigious times, no company can afford to ignore these matters! The business, shareholders, stakeholders, employees all suffer from the fallout of environmental breaches that is usually seen as deficient business practices and poor management. Hence, EDG Principals set out to focus its business - including its in-house technologies - on addressing the issues of Risk Management for a broad range of organisations from utilities to manufacturing, mining and agricultural businesses. In business, information is KING - without it the ability to operate plant systems effectively is risky. Inadequate data and the inability to control a range of plant necessary for environmental compliance must be recognised by plant managers and stakeholders, and steps implemented to ensure these risk issues are minimised. EDG developed its online automated systems so that clients can operate plant remotely, monitor performance continuously and reliably (given that the wastestreams are often polluted), and report systems operations in real time. EDG set out to ensure its systems can deliver this reliability, resulting in patented devices developed to ensure particulate matter, greases, oils, etc., would not interfere with the operation of remote analytical and control devices. Hence EDG developed HydroSentinelTM and StakSentinelTM for water and air monitorng respectively. EDG products may incorporate proprietary systems from other suppliers in order to facilitate solutions. For example, EDG may use analysers from other suppliers where specialised technology is acknowledged, in order to provide a client with particular solutions. EDG does not 'reinvent wheels', and believes in using well designed analytical systems where possible, coupled to EDG's proprietary sampling and sample preparation systems to ensure reliability in the situations where units are deployed. However, where necessary, EDG has developed its own specialised products, and maintains a commitment to further research and development to improve monitoring technologies and expanding on the range of compounds that can be detected and analysed. The air and water quality monitoring features within HydroSentinelTM and StakSentinelTM can be interchangeable. For example there are occasions where both liquid and gaseous phase monitoring is required, hence the multi-functions can be integrated into a single package. 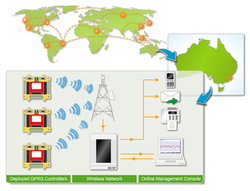 Encrypted and secure Data from each system is delivered in real time via GPRS/GSM telemetry to designated computers and personnel. EDG utilises wireless telemetry systems for the transfer of data from the monitoring site to designated users. GPRS/GSM systems are used for their flexibility, accessability and the need to not incur additional costs through the addition of other communication systems to provide the real time connection required for HydroSentinelTM and StakSentinelTM. The EDG telemetry system allows for the developments of mesh or network systems to facilitate an integrated wireless system for multiple monitoring and control points. Hence a SCADA-type output for plant process monitoring and control is possible should a client require such a facility that can stand alone or be integrated into existing plant process control system,s if required. EDG telemetry allows for monitoing anywhere in the world in real time, along with remote process control if required. Data can be secured through encryption if necessary, and delivered to designated personnel for discrete access.